You missed the Bella's Birthday Invitation, one of the best known and classic Disney princesses. Well here it is! You can already download 100% FREE, without trap or cardboard. In high quality so you can print or send it by Whastapp. 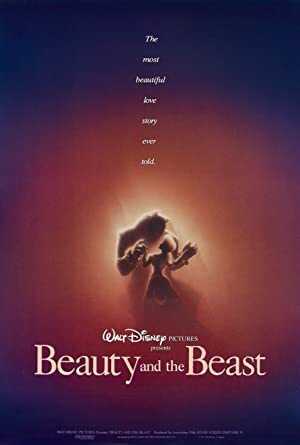 Like most movies about Disney princesses, Beauty and the beast, is based on a classic story from centuries ago. In this case, the first published version is of the year 1740, written by Gabrielle-Suzanne Barbot de Villeneuve, but it is not more than a version of the different variants such as the story of Apeluyo with title Cupid and Psyche. The Disney movie was the first animated film to be nominated for an Oscar for the best film, since at that time there was no Oscar for the best animated film. It was also the first animated film to beat the 100 million dollars in revenue. Worldwide reached the 403 million dollars, a great success for Disney. 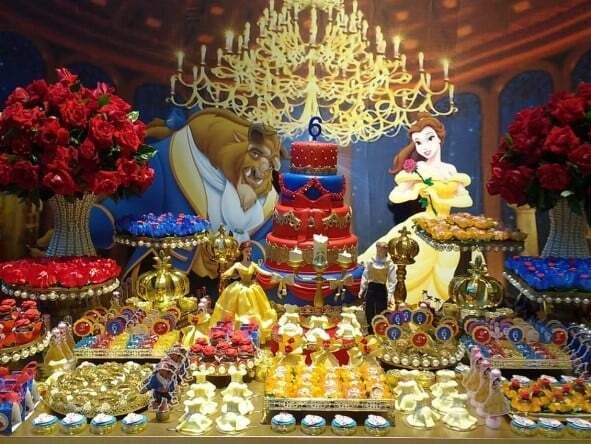 How many times have birthday parties based on Beauty and the Beast been celebrated around the world? Surely many girls have put on a Costume of Princess Bella at some point, and if not, even the oldest will be in time to do so. To organize a good birthday party of Beauty and the Beast begins with the Invitation to the Birthday of Bella, Banderines and Boxes to put personalized treats with stickers with elements or characters from the film. Now, if you can afford it, organize what can be a great memory for your daughter, and use everything you can related to the theme. I give you some ideas: Bella's plastic tablecloth, Bella and Beast glasses and dishes, Bella and Beast balloons and all kinds of personalized decoration on paper. Do not miss our Custom premium decoration packs for Bella and Beast Birthday Party that we will personalize in digital format for you and you will be able to receive by working 24 / 48h. Print as many times as you want what you like the most and leave everyone hallucinated! 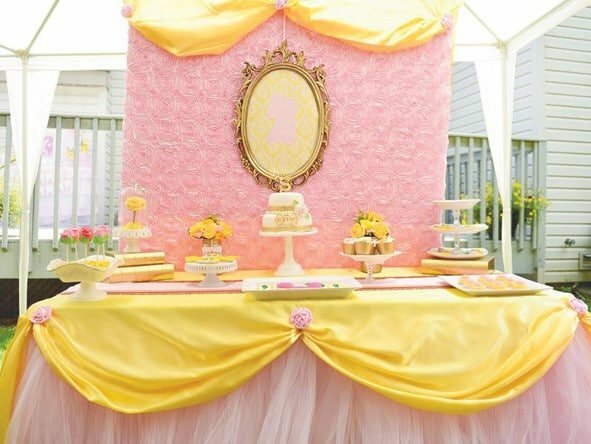 The sweet table will be the main element of the party. Many novice decorators do not give importance to the tablecloth, when it is the main base of the table, and the absence of it, or using a simple white paper tablecloth, lowers the level a lot. Think well that it will be better. In this case for Bella, we recommend colors, yellow and pink. The table where diners will enjoy the snack should not be forgotten. Sometimes the abundance of decorations is sinned, a big mistake. Ideally, look for a minimalist design, but with the right colors. Everything will stand out beautifully and the guests will be able to appreciate all the elements without some tapping others. In some countries or family customs, sometimes "well-used" tables are preferred, in which they do not leave a square centimeter uncovered. Although I personally prefer simpler tables, this does not mean that this is a bad option, everything depends on the circumstances. In this case, the color red obscures the scene and takes away the yellow's protagonism, being this color the one that defines Bella with her beautiful dress. Get a beautiful decoration for the birthday party about Beauty and the Beast. To the family, friends, parents of your daughter's friends, but above all and especially to your daughter, who will be the protagonist for that day. For this, you have Premium decoration kits for Bella and Beast birthday party that we can customize for you with the name of the birthday boy / girl. Prince Adam was not a role model, rather he was a cruel, unfriendly and selfish person. A sorceress wanted to teach her a lesson, but not before offering her one last chance. She transformed herself into an old woman and asked him to allow her to enter her castle to protect herself from the cold of the night, offering her a rose in return. The prince in his line, mocked his gift as if it were still something necessary to want to take care of an old woman and get rid of the deadly night chill, but also cast her out of his castle without contemplation. The sorceress, who should have already taken action, told her again that she should not trust appearances because beauty is inside. As expected, the prince ignored her and dragged her out of his castle. The sorceress recovered her original form, which was of a beautiful young woman and the prince after seeing her wanted to excuse. He transformed it into a Beast, and enchanted all its castle, turning all its stewards and assistants into mere elements such as clocks, cups, and candles. The rose that the sorceress had offered her was enchanted, and told her that when she turned the 21 years it would begin to wither, and once the last petal fell, she would become a Beast forever. The only way to avoid it, would be if you get a woman to love him while maintaining his appearance as a Beast. 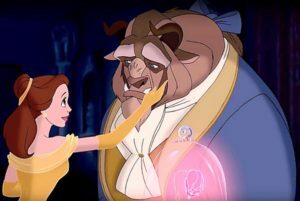 Do not miss the Bella and Beast trailer. One of Disney's classics. A beautiful young woman named Bella agrees to stay in a castle with a beast in exchange for her father's freedom. The beast is actually an enchanted prince. To break the spell, you must win the love of a beautiful lady before the last petal of an enchanted rose falls. The free invitation of Bella and Beast can be downloaded below, but it has a small drawback: you will have to fill in by hand with a ballpoint pen or marker the data as the day and place of the event. Also, it will not include any personalized data. La Bella and Beast birthday invitation is designed in high quality, 300 dpi, perfect for printing both at home with any type of printer, as well as in a printing or online printing service.